How Often Should You Survey? Imagine having employees that were loyal to your organization. Imagine having a team where employees are constantly going above and beyond, providing incredible service to make sure your customers are happy. What if there was a simple way to measure loyalty and then know exactly what makes an employee more likely to be loyal or not? The employee Net Promoter Score (eNPS). eNPS stands for employee Net Promoter Score and is a way for organizations to measure employee loyalty. The Net Promoter Score, originally a customer service tool, was later used internally on employees instead of customers. It measures the likelihood of whether an employee would be willing to recommend your organization as a place to work and the products/services they sell. It will give you the insights you need to understand exactly what employees like and don’t like about your organization. While it’s not meant to be a complete way of measuring employee engagement, because of its simplicity, eNPS is an amazing way for anyone to get started. In this guide, we’ll explain everything you ever wanted to know about the eNPS and give you tips on how you can start using it to increase employee loyalty. 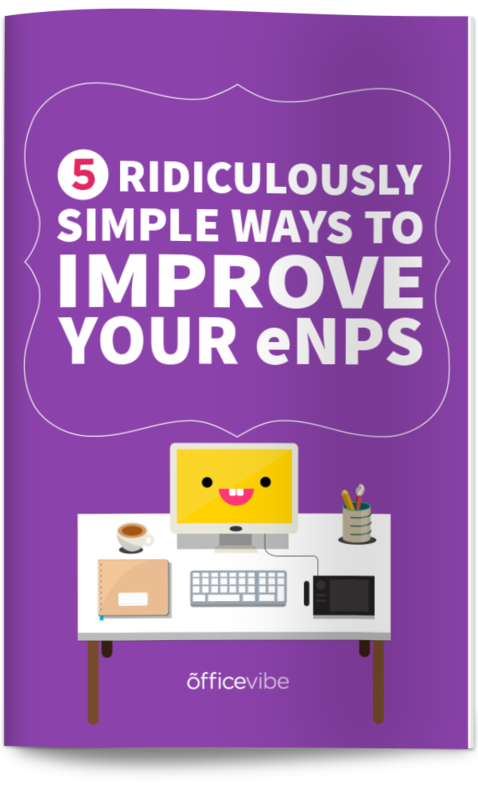 Download this helpful guide: 5 ridiculously simple ways to improve your eNPS score to start consistently having loyal employees. Why is employee loyalty important? No problem! Just enter your email address and we'll send you the PDF of this guide for free. If an employee feels attached to your brand then they will do what every team leader dreams of – give discretionary effort. They’ll go above and beyond and actively look for ways to improve the organization. And the research has shown how much more productive and profitable engaged employees are. You want employees that feel connected to your brand. This is so important, because employee turnover is incredibly expensive. On average, it costs about 20% of an employee’s annual salary to replace them. For example, the cost to replace someone earning $50,000/year would be $10,000. But it’s hard to predict the actual cost of employee turnover because of how many other things are affected by an employee leaving. Want to see how much turnover is costing you? Use our ROI calculator now to see how much money you could be saving. But even more than the financial costs of turnover are the emotional costs that it has on morale of the organization. Based on our latest research on employee engagement, 59% of employees wouldn’t recommend their organization as a good place to work. Understanding exactly how loyal your employees are and the reasons behind why they’re loyal or not can have major impacts on your business. 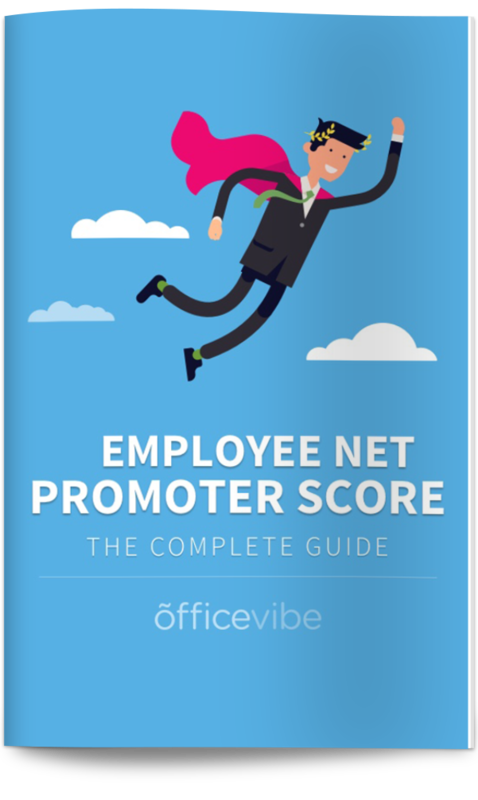 <a href=”http://hs.officevibe.com/tips-improve-enps”><img src=”https://assets.officevibe.com/infographics/infographic-hubpage-enps.png” alt=”What You Need To Know About Employee Net Promoter Score” width=”600px” border=”0″ data-no-lazy=”1″ /></a>This infographic was crafted with love by Officevibe, the software that helps you increase your <a href=”https://www.officevibe.com/employee-engagement-solution/employee-net-promoter-score”>employee net promoter score</a> to create a company culture your employees will love. Back in the early 1990’s, Fred Reichheld, a researcher from Bain & Company, conducted a research project to find the most efficient way to measure customer satisfaction. He argued that traditional customer surveys took too long to create and analyze to generate any meaningful change. The results were clear yet counterintuitive. It turned out that a single survey question can, in fact, serve as a useful predictor of growth. But that question isn’t about customer satisfaction or even loyalty—at least in so many words. Rather, it’s about customers’ willingness to recommend a product or service to someone else. In fact, in most of the industries that I studied, the percentage of customers who were enthusiastic enough to refer a friend or colleague—perhaps the strongest sign of customer loyalty—correlated directly with differences in growth rates among competitors. Many companies started using this one simple question to measure and improve their customer loyalty. A few years later, Apple started using it in their retail stores to find great employees. They started asking retail employees how likely they would be to recommend the retail store as a place to work. The thinking was that because they’d now have the same tool to measure both customer satisfaction and employee satisfaction, it would make finding and dealing with issues much easier. The biggest difference is that NPS is done with your customers and eNPS is done with your employees. In this video interview with Rob Markey, one of the creators of the Net Promoter score, we talk much more about the history of eNPS. Someone is considered a Promoter when they score either a 9 or 10 on the question “On a scale from 0-10, how likely are you to recommend this organization as a good place to work?”. It’s simple to think that since they’re already happy and promoting, we don’t need to focus on them. Use their knowledge to understand what they like so much about the organization. Use that feedback to help you recruit and retain your talent. Ask them how you can improve even more. Someone is considered Neutral when they score either a 7 or 8 on the question “On a scale from 0-10, how likely are you to recommend this organization as a good place to work?”. We consider them neutral because it’s assumed that they’re neither going to promote or talk negatively about the organization, they’re generally satisfied, but since they don’t affect feelings of the organization, they’re not included in the score. But that doesn’t mean you shouldn’t pay attention to them. Even though they’re ignored in the score, don’t ignore their feedback. Consistently work to make them promoters. Your goal should be to have as many promoters in the company as possible. Find out what it would take to get them to promote. Ask questions like “What’s the #1 thing holding you back from promoting our organization?” But more than anything, you want to create a culture of feedback where everyone can share their feelings openly and honestly. To learn how you can turn neutrals into promoters, check out these helpful tips. Someone is considered a Detractor if they answer anything between 0-6 on the question “On a scale from 0-10, how likely are you to recommend this organization as a good place to work?”. What this means, is that ultimately they’re unhappy. Something is bothering them and you need to get to the bottom of it. Find out what’s on their mind, tell them not to be scared and to share what they really think. The best thing you can do is show that you genuinely care and that their concerns are being heard. If they feel like they’r being listened to, that will help nudge them in the direction of becoming a promoter. You need their feedback to get better. Remember that eNPS is a measure of loyalty, and so you don’t want these people leaving you. Turnover is incredibly costly and annoying, you should be doing everything you can to improve their perceptions of the culture. To learn how you can turn detractors into promoters, check out these helpful tips. People love the eNPS for its simplicity. Because it’s so simple and quick, you can ask the question more often than an annual survey for example. But he later found that also asking a second question will yield even better results. The reason for the second question is that you could have an amazing place to work, like a nice break room, foosball table, etc. but some of the underlying issues and policies are no good. So it’s not enough to ask if you would recommend a company as a good place to work. You could also have the opposite – a terrible work environment with a micromanaging boss but the company makes an incredible product that you’d be willing to recommend. One of the biggest mistakes companies make is that they’ll only ask these quantitative questions and focus exclusively on their score. The real value comes in the follow up question of “why”. What’s the number one reason why you’re willing to recommend this company? What’s one thing we do well that makes you willing to recommend? Or some variation of that. What’s one thing we’re doing that’s holding you back from recommending? What’s the reason for the score you gave? Basically, anything that lets you dive deeper to find out what you’re doing well and what could be improved. The most important thing to understand when trying to answer this question is how survey fatigue works. The longer your survey, the less people will complete it and the less accurate the results will be1. Because the eNPS consists of a total of three questions, you can feel free to do it much more frequently. Some companies do it every month, some do it every three months, and some do it twice a year. Doing the survey consistently every three months is a great idea, and will give you enough data to work with. Then what you do is subtract the percentage of detractors from the percentage of promoters. Since the eNPS score is represented as a number and not a percentage, you can just remove the percentage sign and say you have an eNPS of -10. People who gave you 7 or 8 aren’t included in the calculation because they’re neutral. They aren’t likely to go one way or another, so we don’t include them. Importantly, people who skip the eNPS question will be considered as neutral. Including skipped responses offers you an even better representation of your workplace as it evolves over time. If your eNPS is negative, it means that there are more detractors than promoters and that you might have some employee engagement issues. You’ll want to dig deep into that written feedback to see what’s going wrong, and then work aggressively to improve. If your eNPS is positive, it means that you have more promoters than detractors, which is a great thing. You’ll want to find out what you’re doing well to use that to attract and retain amazing talent. What’s A Good eNPS Score? Then the question becomes, what’s considered a good score? The scores can vary anywhere from -100 to +100, but keep in mind that you shouldn’t focus so much on the score, you should be paying much more attention to the written feedback that employees will write in about what needs improving. That’s where the real value is. Having said that, a good score is anything positive, and if you’re able to get a score anywhere between 10 and 30 you should be very proud of yourself. Anything less than -10 is where you should start to worry, anything between -10 and +20 is a normal score to have. If you’re able to get anything above 40 or 50 you should consider yourself very lucky. Important: Your eNPS score will be lower than your NPS score. This is because employees hold your company to a higher standard than customers do since they have more time/energy invested in it. Employees will be tougher critics, so don’t be upset if your eNPS score is lower than your NPS score. Many people will want to benchmark themselves against their competitors in their industry, and now that more companies are using the eNPS, it’s becoming possible, but you’re making a huge mistake. Benchmarking against other companies isn’t the best way to do it. Instead, you should be benchmarking against yourself. Asking yourself how you can improve against your competitors is the wrong question to ask. Instead, ask yourself what you can improve internally so that your employees are willing to go the extra mile for your customers. At the end of the day, the most useful benchmark a company can use is its own progress over time. Be careful about benchmarking against other companies in your industry, instead you should benchmark against yourself. The main thing you need to think about is how to improve your own score. The most important thing to keep in mind when trying to improve your score is that it’s a marathon, not a sprint. These things take time, effort, and a lot of teamwork. Everyone needs to be involved, and if you can have both customers and employees giving you feedback, you’ll be able to create that full cycle of improvement. Here are a few ideas to help you improve your eNPS score. Transparency is super important when it comes to improving your eNPS. You need to get employees involved in the process as much as possible. Not only will this help you improve your score, but your employees will feel more responsible, increasing their engagement. Share as much as you think you’re able to, but you shouldn’t have anything to hide. There’s nothing more frustrating for employees than if you conduct a survey of any kind and you don’t follow up. There is a goldmine of information in these eNPS surveys that you need to use. You can even establish a cross-functional committee to handle the feedback, communicate the results, and make a plan for implementing changes. The dream is to be able to get to a place where you can conduct NPS surveys with your customers, eNPS surveys with your employees, and creating a feedback cycle between customers – employees – management. This takes a lot of work, but will have unbelievable effects on your business. Another cool (more advanced) idea is to filter the data to get even deeper insights. More often than not, you’ll simply thank promoters for their feedback and ask them why they’re so likely to recommend. But another idea could be to ask them what you could do to be even better. It’s very possible that they’ll be willing to help you since they care so much about your brand. Many people make the mistake of focusing too much on the eNPS. While it is a valuable metric to be tracking and continuously improving, it’s not all that matters. eNPS is only one part in an entire feedback loop that should include employee engagement surveys, performance reviews, regular one-on-ones, and other forms of personal development.